Unwrap sponge cakes. For each dessert, cut 1 sponge cake crosswise into 4 pieces; arrange pieces, cut side down, on individual dessert plate. Spoon 1 tablespoon lemon curd onto each. 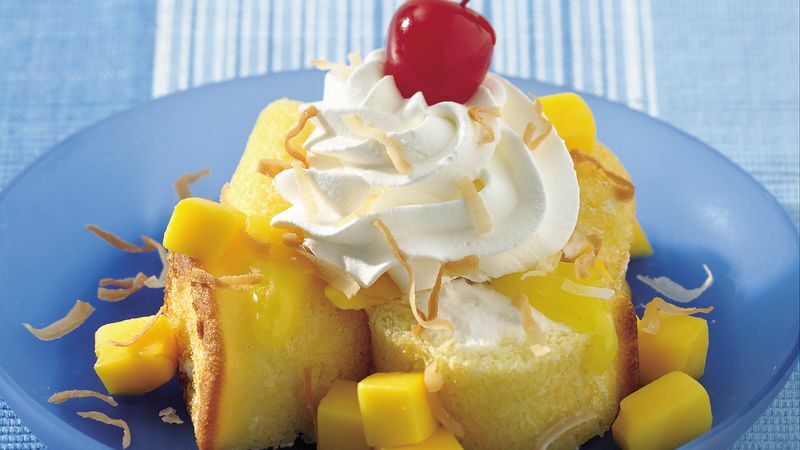 Top with mango and whipped cream. Sprinkle with toasted coconut. Use pineapple in place of the mango if you'd like. To toast coconut, spread on small cookie sheet; bake at 350°F. for 5 to 8 minutes or until light golden brown, stirring occasionally. Top each serving with a stemmed maraschino cherry.